Choose from two versions: Vanilla Fixes links 80+ unused vanilla encounter zones to their related location cells, while All Exteriors Zoned applies encounter zones to (almost) every exterior cell, eliminating exterior/interior enemy level mis-match. Main Files: Fixed Deepwater Redoubt water bug; removed dragon lair CELL records. Patches: Fixed missing LOD record. Fixed wild edit in All Encounters Zoned file. Many thanks to wcpaeb for finding the cause of the CTD! Completely rebuilt the mod from scratch in the Creation Kit, and resolved missing location errors etc. Added 2nd main file that covers (almost) all of the exterior cells in Skyrim, removed fort optional file as it is merged into the All Exteriors Zoned file. Uploaded mod. Includes main file with RW2 and Luminosity patches, and optional file with RW2 patch. While attempting to test my encounter zone overhaul, I realized that a fairly large number of vanilla encounter zones were never implemented in the game. 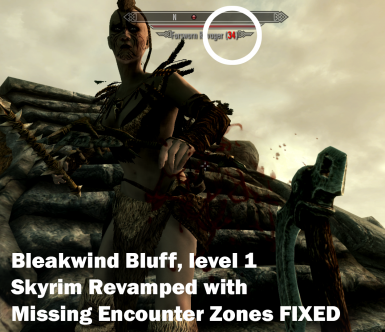 This means that changes from mods like Skyrim Revamped - Loot and Encounter Zones are not properly applied to enemies in multiple cells across Skyrim and the DLCs. 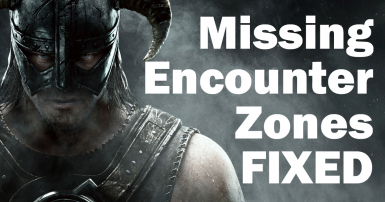 The Unofficial Skyrim Special Edition Patch fixes some unused encounter zones, but still leaves 80+ untouched. I consider this mod to be an extension of their bug fixes — areas such as Valtheim Towers had encounter zones created in the Skyrim.esm that were never applied, and this mod fixes that. Choose one of the two main files, and install with your usual mod manager. I recommend MO2. Patches for Realistic Water Two are available for both versions. You do not need to make a new save when installing or updating this mod - I went and tested on my current playthrough save, and the changes were applied perfectly to locations I'd never visited or run past. You might need to wait 3 in-game days for things to reset, if you want to be extra careful. If you want this mod's changes to apply to locations you've already visited then you do need the Encounter Zones Unlocked mod installed. All files are ESPs flagged as ESLs, and will not take up plugin slots. This file only corrects the unused encounter zones from the vanilla game. If using an encounter zone mod, you will still notice a mismatch between exterior and interior enemies in many places. I have included this file for people who might only want the "bugfixing" portion of this mod. 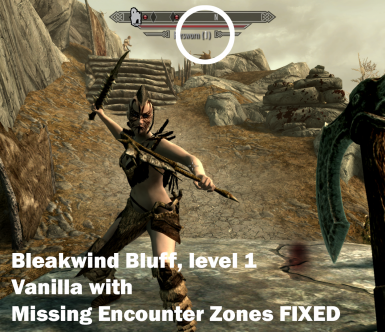 This file applies encounter zones to almost every named exterior cell in Skyrim & Solstheim and includes the vanilla fixes. It covers forts, camps, towers, and more. If you are using an encounter zone mod, there should be little to no mismatch between exterior and interior enemies in 90% of locations. Please note that due to the way encounter zones work, you might still find the occasional level 1 enemy at a fort at level 1 — this is because of hand placed NPCs that are not chosen from leveled lists, and therefore not affected by encounter zones. If using the All Exteriors Zoned version, it is highly recommended to use Encounter Zones Unlocked as well. This mod does not touch encounter zone records — it creates encounter zone references in the proper CELL records. As such, it will have minor conflicts with any mod that edits CELL records, including location, water, and lighting mods. If you want it to win conflicts over those mods, then you should place it after those mods so it doesn't get overwritten. It is compatible with mods such as Immersive World Encounters and Populated Dungeons & Caves when loaded after their plugins. If you use LOOT, the masterlist has been updated and includes rules for this mod. It should sort correctly now! No conflicts with Relighting Skyrim Exteriors﻿ plugin. Load after ELFX - Exteriors﻿ plugin. Load after ELFX main plugin﻿; the only conflict is Thirsk Mead Hall, where the ELFX settings will get overwritten. If you use Realistic Water Two﻿, place the patch below RW2. If you use MLU, I recommend loading this plugin after MLU's plugin; that way you will get MLU's edits to weapon placement and this mod's changes without needing to make a patch. DO NOT install MEZF and the full version of T'Skyrim﻿ at the same time!! T'Skyrim Full integrates an unknown version of MEZF into its plugin and I cannot guarantee its stability or compatibility. This mod is not affected by a Bashed Patch — the bashed patch does not touch Skyrim's CELL records — so its load order location is important for changes to take affect. Due to the nature of this mod, you will run into level 20+ enemies in the Tamriel worldspace if you are using an encounter zone mod such as Skyrim Revamped - Loot and Encounter Zones and the All Exteriors Zoned file of this mod. From my perspective, this is a desired behavior — it resolves the issue of walking up to Fort Greymoor, only encountering level 1 bandits, and walking inside to be swarmed with level 20+ bandits. Now the level of exterior enemies will properly reflect the level of enemies inside the fort! v2.0: Completely rebuilt the mod from scratch in the Creation Kit, and resolved missing location errors etc. Added 2nd main file that covers (almost) all of the exterior cells in Skyrim, removed fort optional file as it is merged into the All Exteriors Zoned file.